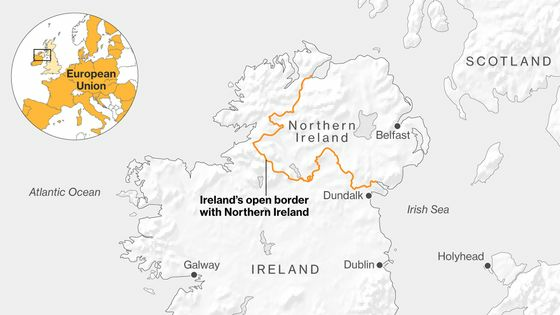 (Bloomberg) -- The European Union is leaning toward allowing Ireland to maintain an open border with Northern Ireland in the immediate aftermath of a no-deal Brexit, according to a person familiar with the matter. Instead, the European Commission will seek evidence of a government plan to deal with the flow of goods along the bloc’s new land frontier with the U.K. over time, according to an EU diplomat, who asked not be named as deliberations are ongoing. Initial talks have been undertaken on the matter, but no concrete proposals have been tabled. 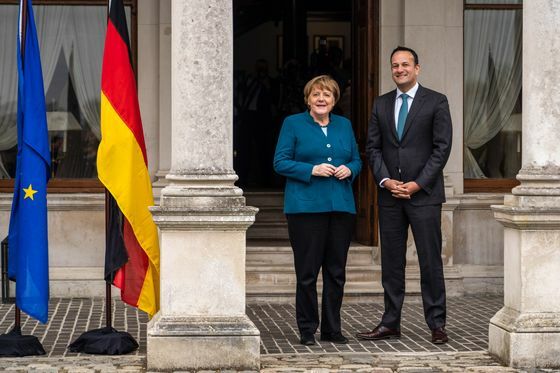 German Chancellor Angela Merkel will meet Irish Prime Minister Leo Varadkar in Dublin on Thursday, in part to discuss his plans for a no-deal Brexit. Though U.K. Prime Minister Theresa May and Labour leader Jeremy Corbyn are trying to thrash out a Brexit compromise, the risk that the U.K. crashes out of the bloc without a deal remains. For Ireland, the dilemma is this: policing the border could endanger the region’s peace process. Failing to do so could endanger Ireland’s access to the single market. If the U.K. tumbles out of the bloc without a deal, the question that has dogged Brexit talks -- how to avoid a hard border on the island of Ireland -- becomes an acute crisis. Merkel has long been concerned about the problem. In a 40-minute call in January, she pressed Varadkar to explain his position that the government wouldn’t ever introduce physical infrastructure on the 310-mile (500-kilometer) border -- the German leader was concerned that this risked undercutting the EU’s negotiating position on the so-called backstop, designed to keep the border invisible. Still, she remains sympathetic to the Irish. Merkel said Wednesday that Ireland is the focal point of the EU’s efforts to find a deal. “We often say Europe is a question of war and peace, and here you can basically see that it is a question of violence and non-violence,” Merkel told reporters after meeting Eastern state premiers in the Thuringian village of Neudietendorf.